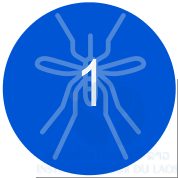 The recent economic development of Laos, characterized by one of the highest rates of urbanization in the ASEAN community and the development of outer-urban zones where the density of population is combined with rural activities, offers ideal ecosystems for the proliferation of Aedes mosquitoes, specifically in Vientiane. 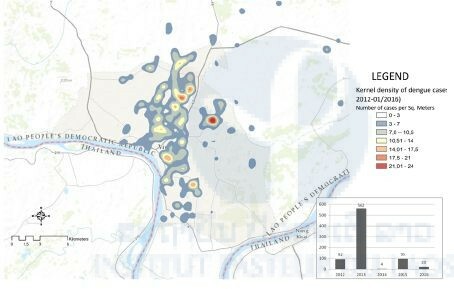 An epidemiological study carried out in Vientiane since 2012 has shown the existence of dengue transmission hot spots in several areas of the city (Figure 1). It is important to know the dynamics of the mosquito populations during the dry and rainy seasons in these various localities. Indeed, it is crucial to understand the geography of Aedes mosquitoes regarding their environment in order to understand if risk factors are related to the Aedes index or—as suggested by other researches—to other factors. To do so, mosquito larval measurement (Breteau index and container index) will be carried out in different types of areas (created by GIS). The result of the surveillance will allow us to identify times and locations where mosquito control would have the maximum impact on disease diffusion in the city (in central or rural spaces, during transmission or low transmission season, etc.). If other mosquito species are present during the Aedes surveillance, they will be collected and screened for arboviruses. Figure 1: Kernel density of dengue cases in Vientiane, Laos (2012–01/2016). During inter-epidemic periods or when the elimination of mosquito breeding habitats is not easily achievable, insecticide application in larval habitats is routinely conducted by public health services in many countries, including the Lao PDR (Rawlins 1998, Rodriguez et al., 2002, Thavara et al., 2004). Space-spraying applications are conducted during epidemics or when the entomological indices of mosquitoes are high. For both larviciding and adulticiding, organophosphates and pyrethroids are the insecticide families of choice, worldwide and in the Lao PDR. Unfortunately, many dengue vector control programs are threatened by the development of insecticide resistance in Aedes populations across the world (Marcombe et al. 2009). Strong levels of resistance to organophosphates and pyrethroids have been detected in Aedes aegypti populations in Southeast Asia (Marcombe et al., 2009, 2014 ; Jirakanjanakit et al., 2007; Ranson, 2010; Kamgang et al., 2010 ; Vontas et al., 2012). The organophosphate temephos (larvicide) and insecticides from the pyrethroid family (permethrin, deltamethrin; adulticides) have been used in the Lao PDR for decades and specifically during the last outbreak in 2013. Compared to its neighboring countries (Vietnam and Thailand), there was no information available on the resistance status of Aedes populations and the possible impact of the resistance on vector control operations in the country. A preliminary study led in 2015 by the Institut Pasteur du Laos showed insecticide resistance in Aedes populations from several provinces as well as in Vientiane (Marcombe et al. in prep). 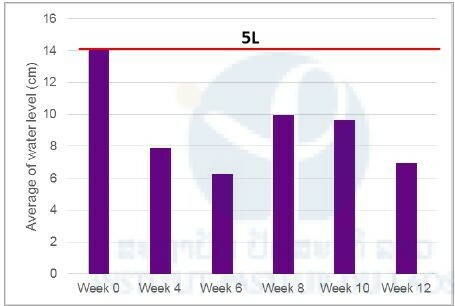 In view of these results, it is important now to know more precisely the distribution and resistance levels of the populations of vectors in Vientiane in order to propose alternative strategies. Resistance to conventional insecticides (temephos, deltamethrin, permethrin, and malathion) were tested on Aedes aegypti and Ae. albopictus larvae and adults collected in Vientiane. Distribution maps of the resistance by species and at larval/adult stages will be drawn up and shared with stakeholders to improve the efficiency of the vector control campaign. In recent years, a number of new tools to combat vectors have been developed and present an interesting potential to replace or strengthen the current expensive and laborious methods of larvicide treatments and fumigation. Furthermore, the actual efficiency of these methods is often discussed (Marcombe et al. 2012). Among these tools, the method described as “auto-dissemination” presents an innovative technique for the treatment of breeding sites. It consists of using female mosquitoes themselves as carriers of an insecticide, the pyriproxyfen (insect growth regulator), and to make them transfer the insecticide to the larval breeding sites in urban areas (Figure 2). The potential of this technique and this insecticide was proved in small-scale trials in Peru, Italy, and Madeira (Guess et al., 2009; Caputo et al., 2012) and is in development on other sites. We suggest in this project studying the efficacy of this method to control vectors in the specific urban environment of the city of Vientiane. Figure 2. In2Care® mosquito trap. After selection of 4 sentinel sites (Figure 3), vector density is surveyed during the dry and rainy season. Adults and larvae were trapped by 2 Ovitraps and 2 BG sentinel trap inside and outside the houses. Traps are checked weekly and shipped to IPL entomology unit where larvae are reared to adults for taxonomy and resistance testing and adult mosquitoes are identified and thus kept at -80oC for arboviruses screening. Larval bioassays on the Aedes sp. populations were run with diagnostic dose (WHO recommended) of deltamethrin (0.00132 mg/L), permethrin (0.0032 mg/L), temephos (0.0132 mg/L) and DDT (0.04 mg/L). Mortality was recorded after 24h. Following WHO criteria a population is considered resistant if the mortality after 24 h is under 90%, resistance is suspected with mortality between 90 and 98% and a population is susceptible with mortality over 98%. Adult bioassays were run using filter papers treated with diagnostic doses of deltamethrin (0.05%), permethrin (0.25% ), DDT (4%), and malathion (0.8%) following a WHO protocol. Mortality resulting from tarsal contact with treated filter papers was measured using WHO test kits on adult mosquitoes of the different populations. Four batches of 25 non-blood-fed females (2–5 days of age) were introduced into holding tubes and maintained for 60 minutes at 27 ± 2°C and a relative humidity of 80 ± 10%. Insects were then transferred into the exposure tubes and placed vertically for 60 minutes under subdued light. Mortality was recorded 24 hours after exposure. Mortality was recorded after 24h. Following WHO criteria a population is considered resistant if the mortality after 24 h is under 90%, resistance is suspected with mortality between 90 and 98% and a population is susceptible with mortality over 98%. 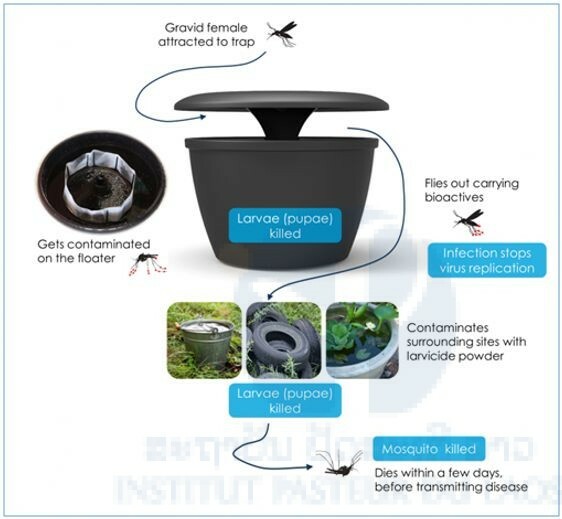 The new tool is the In2Care® Mosquito Trap that attracts and kills Aedes females with ingredients that target both mosquito larvae and adults. It is the first to exploit the concept of ‘auto-dissemination’, resulting in an effective kill of mosquito larvae in breeding sites surrounding the trap. In2Care® Mosquito Traps can be placed both indoors and outdoors at a recommended density of 1/400m2 (10 traps per acre) and be maintained every 4-6 weeks using refill sachets. The Trap uses a combination of a US-EPA approved entomopathogenic fungus that kills the adult mosquitoes, coupled with a WHO-recommended juvenile growth hormone mimic (Pyriproxyfen (PPF)) that is specific to diptera and kills larvae. The In2Care® mosquito trap has been validated in field studies (Snetselaar et al. 2014). The female mosquitoes are attracted to the trap to lay eggs (oviposition). Once in the trap they become contaminated with fungal spores and PPF. She will then fly off with both spores and PPF to find oviposition sites and upon laying her eggs will contaminate the water with PPF. The PPF will then kill the developing larvae. The female herself will eventually die from the fungal infection (Figure 2). A pre-evaluation study was executed in Laos at IPL in a 3 month timeframe before the onset of the ECOMORE trial (November 2017 to April 2018). The main goal is to test the long-lasting efficacy of In2Care Mosquito Traps under the tropical climate conditions in Laos against wild-type Aedes vectors to determine if the servicing timeframe can be extended to 2 or 3 months. The study objectives was to assess the quality of the trap water, its attraction to Aedes mosquitoes, and the quality of the Beauveria fungus spores and the PPF larvicide over time: measuring at 4, 6, 8, 10 and 12 weeks post-deployment. The trap location located in the premises of the IPL campus are shown in Figure 4. Additionally, we assessed if the addition of spinosad to the water of the trap can achieve a quick kill of Aedes larvae, which is warranted by some Asian countries that fine inhabitants when live larvae are found on their premises. We will test if addition of spinosad does not affect trap attraction or efficacy. Outcomes will help determine when water needs to be added and/or refreshed, and at what time interval maintenance with new refill sachets (refreshing the bioactive powders) is needed. Figure 4. 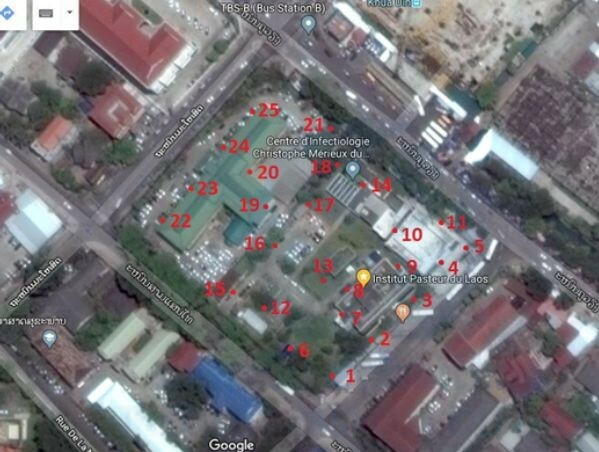 Locations of the In2Care mosquito trap in IPL campus. 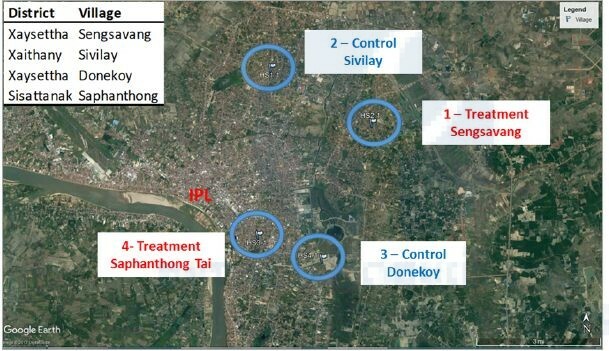 The field trial study started in July 2018 and two villages were selected as treatment sites (Sensavang and Saphanthong tai) and two other villages were selected as control (Donekoy and Sivilay, Figure 5). We coordinated the vector control campaigns with the vector control units of the different district and villages of Vientiane in order to avoid any interferences in our study sites. Dengue transmission rates (confirmed cases/dominant serotype) and mosquito abundance (larval/adult traps/indexes) was measured before and, during the interventions to estimate the efficacy of the new vector control method. The traps were maintained every 6 weeks (water and insecticide refill) and this will be until the end of the project in 2019. The water from 5 traps in each villages is sampled and brought back to the laboratory and Ae. aegypti larvae (3rd instar) are exposed to this water and the mortality is evaluated. 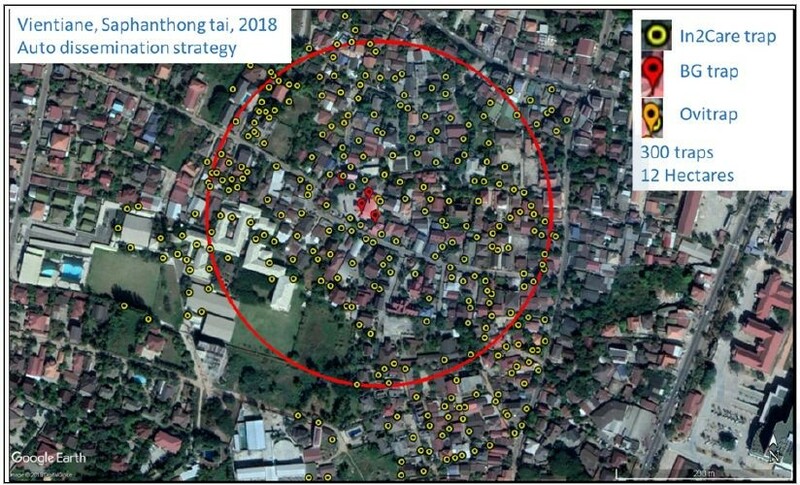 Figure 5 shows the abundance of Aedes larvae in in the 4 villages and Figure 6 shows the number of adult collected in the BG-Sentinel traps in Vientiane. For both, adult and larval abundance, the results showed that the abundance pattern over time follow the dry/rainy season model (i.e. high abundance during season and vice-versa) and show that is these locations the mosquito vectors are present throughout the year. It is too early in the project to show the efficacy of the new technology on the number of mosquito collected. The results of the larval bioassays are presented in Figure 7. Larval Ae. aegypti and Ae. albopictus mosquito populations from 4 villages in Vientiane Capital were tested. Two larval Ae. aegypti populations tested were highly resistant to deltamethrin, permethrin and DDT. All larval populations were resistant to temephos except the population from Sivilay village (100% mortality). Aedes aegypti adult populations from 4 villages were tested. All the populations tested were highly resistant to all the insecticides tested. The results showed that larval Aedes albopictus mosquito populations from Sengsavang and IPL were resistant and suspected resistant, respectively. Both populations were resistant to DDT. The populations from Sengsavang was susceptible to deltamethrin and suspected resistant to permethrin. The IPL population was susceptible to permethrin and suspected resistant to deltamethrin. The results of the adult bioassays showed that the 2 Aedes albopictus mosquito populations were highly resistant to the organochlorine DDT and the organophosphate malathion. Both populations were susceptible to deltamethrin and were susceptible and /or suspected resistant to permethrin. Figure 7. 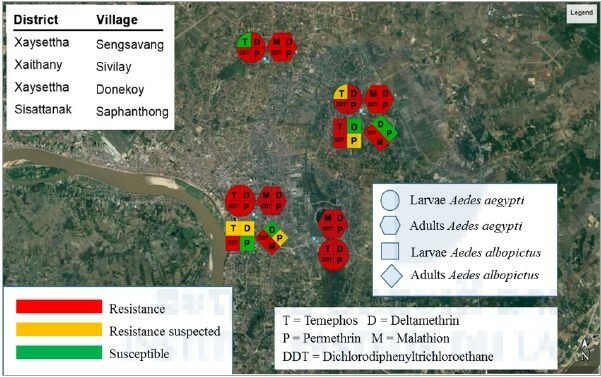 Insecticide resistance distribution in dengue vectors in Vientiane, Laos. The results showed that after six weeks during the dry season, the average water level in the traps was divided by 2. The recommendation at the lights of these results is to refill the traps with water every six weeks for the field trial. Figure 8. Average water level in the trap during the implementation. The results showed that after 1 month 24% of the traps were colonized by Aedes sp. mosquitoes and none of the spinosad treated traps had larvae (Table 1). After the implementation of the In2Care traps, Aedes larvae were still collected in ovitraps (Figure 9), but none of them emerged to adult mosquitoes and after the installation, only one Aedes mosquito has been collected inside the BG sentinel traps (Figure 10). 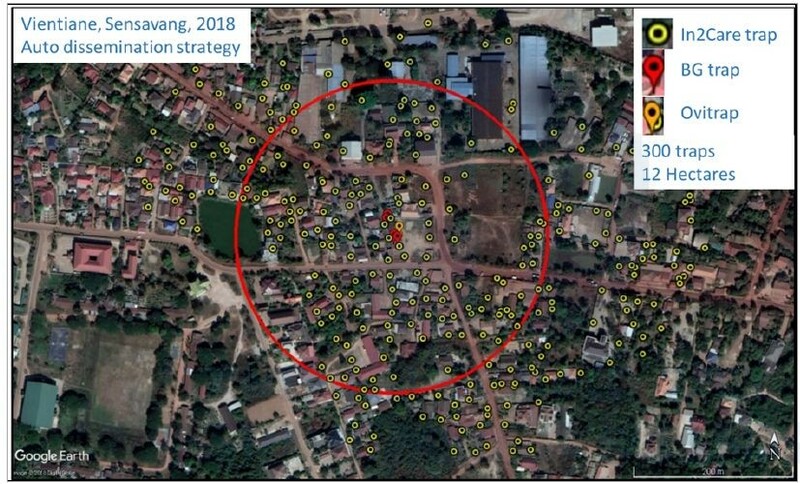 Figure 11 and 12 show the distribution of the auto-dissemination traps in Saphanthong tai and Sensavang villages, respectively. The large scale field trial is ongoing and results will be presented next year.